There’s a good reason many superheroes are also billionaires: because the fancy gadgets that Iron Man and Batman rely on cost untold millions. It makes fantasies like owning your very own Batmobile nearly unachievable, although with its new RC Ultimate Justice League Batmobile, Mattel might have a half-decent way to alleviate your superhero envy. An incredibly detailed RC replica of Batman's iconic ride. Countless realistic features, including a working, smoke-spitting exhaust. Driving an RC toy using a touchscreen app is torture. Every superhero movie is accompanied by an onslaught of toys based on characters, scenes, and vehicles in the film, and by now there are millions of miniature Batmobiles in toyboxes around the world. What sets Mattel’s Ultimate Justice League Batmobile apart from the rest is that it’s packed full of wonderful remote control features—and it’s gigantic. Based on the Batmobile first unveiled in Batman v Superman: Dawn of Justice, this 1:10-scale replica measures in at around two feet long. It’s, admittedly, not my favorite take on the Batmobile, but this toy is a near-perfect replica of the movie version of the car, and the design grew on me the more I played with it. It’s clad in mostly plastic armor, but thanks to a sizeable lithium ion rechargeable battery inside, and various electric motors, the toy is deceptively but satisfyingly heavy. You’ll need to pick it up with both hands. It’s so large that it can actually accommodate an included seven-inch tall Batman action figure who can ride in the cockpit. The figure features added articulation in the shoulders so that his hands can hold the steering wheel while it moves, and a permanent scowl on his face that makes Batman look like he’s stuck in perpetual traffic. At two feet long, this is a massive Batmobile toy that’s even large enough for a seven-inch tall caped crusader to ride inside. Mattel calls this the Ultimate Justice League Batmobile, and there’s definitely an incredible amount of detail included in the replica to help back up that claim. Everywhere you look on the toy there’s something going on, from tiny rivets holding armor in place, to a weathered paint job making the car look like it’s seen a few battles, to working lights, to machine guns that swivel and spin when they’re activated. I was especially impressed the first time I peeked inside the cockpit, where you’ll find a working steering wheel that turns when the vehicle’s front wheels do, and a glowing dashboard that changes color as the Batmobile accelerates. A miniature vape inside the Batmobile produces actual smoke pouring out of the exhaust. On the back of the vehicle you’ll also find a working exhaust. There’s a small reservoir that’s filled with the same liquid used in professional fog machines, and inside the Batmobile is a miniature vape mechanism that produces a realistic trail of smoke as the vehicle drives around. It’s a detail that exists solely for detail’s sake, but it’s also a cool feature to secretly activate when people crowd around the toy. 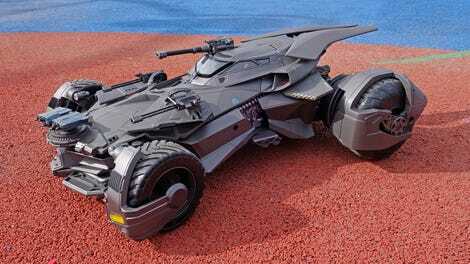 This is definitely a Batmobile toy for die-hard collectors who love to show off their latest and greatest finds, and there’s a lot to show off here. 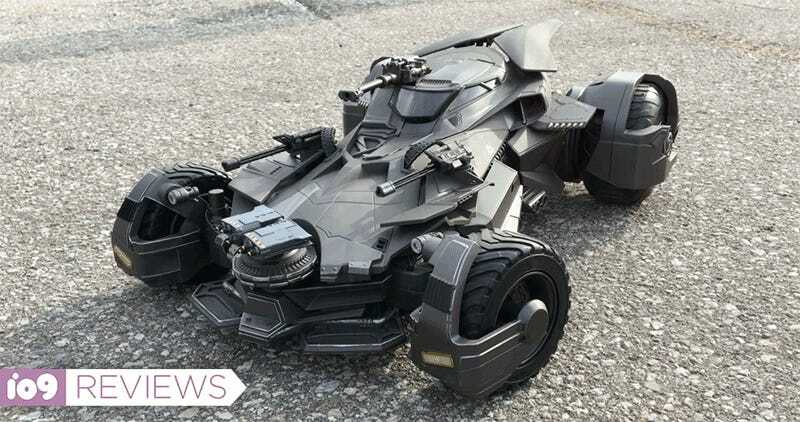 But while Batman fans will not be disappointed after dropping $250 on this replica, remote control car enthusiasts will be. Being able to actually drive the Ultimate Justice League Batmobile is certainly one of its coolest features, but it has its limitations. The cockpit’s dashboard glows, and the steering wheel matches the movements of the Batmobile’s front tires. A pair of machine guns swivel left and right, with barrels that rotate when fired. 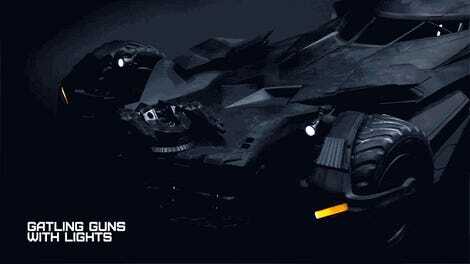 There’s no room for passengers in this Batmobile, unless you’re a giant cannon that can raise and lower. The Ultimate Justice League Batmobile even has working lights on the front and back--safety first! The rockets don’t actually fire, but this missile launcher swivels back and forth as the car’s front wheels do. The armor plating might be made of plastic, but it still looks intimidating. Your brakes definitely need their own cooling vents when your wheels are this massive. There’s even detailing where few people will even bother to look, like under the Batmobile’s spoiler. Do not step on these rockets—good advice. The biggest challenge (and disappointment) with taking the Batmobile for a spin is that it can only be piloted using a touchscreen app running on a tablet or smartphone—not a dedicated controller. So every time you want to take the Batmobile for a drive, you need to need to connect to its own private wifi network and then wait for the app to load up. It’s just a couple of steps, but it took long enough for the procedure to get annoying. Furthermore, without being able to feel the virtual joysticks, it’s hard to keep your fingers on the on-screen steering and accelerator controls while you’re trying to keep an eye on where the Batmobile is going at the same time. It gets even more challenging when you want to activate the machine guns while driving, requiring you to push additional buttons at the same time. I know it reduces the overall cost of a toy, but using a touchscreen app for driving and flying controls is always a disappointment. The app used to control the Batmobile includes a live video feed taken from inside the car’s cockpit. Using an app as the controller does have one redeeming feature here, though. Inside the cockpit, just over Batman’s shoulder, is a tiny camera that streams a live video feed from the Batmobile’s driver’s seat to your tablet or smartphone. You’ll need to leave the cockpit door open to see the road ahead, but the feature genuinely makes you feel like you’re at the wheel of Batman’s ride, complete with augmented reality effects when you fire the machine guns and cannons. Unfortunately, while the Batmobile itself is no speed demon as far as RC cars go, the lag on the live video feed, combined with the angle of the camera, makes it all but impossible to safely drive the toy using the app alone. I tried to carefully navigate it around my home, but not being able to see both wheels, or what was around the Batmobile, meant the car was constantly getting hung up on obstacles. Apparently all the Joker really needed to stop the caped crusader was a misplaced Ikea chair. If you’re a well-funded Batman collector, my complaints over driving Mattel’s Ultimate Justice League Batmobile probably aren’t going to stop you from adding this to your collection—and they shouldn’t. As a collector’s piece, there’s a satisfying amount of detail and functionality packed into this Batmobile replica, and I’m doubtful anyone ponying up $250 for it will even be willing to take it off their shelf, let alone out for a drive where it might get scratched. But if you’re after a really fun remote control car, your money will probably be better spent at your local hobby shop. There you’ll almost certainly find a faster, more durable RC car with a physical controller that makes it much easier to drive. If you really want to feel like you’re a vigilante crimefighter piloting the Batmobile, just pipe Danny Elfman’s Batman theme through your headphones when you take it out for a spin. Batman collectors will be more than satisfied spending $250 on this incredibly-detailed replica. 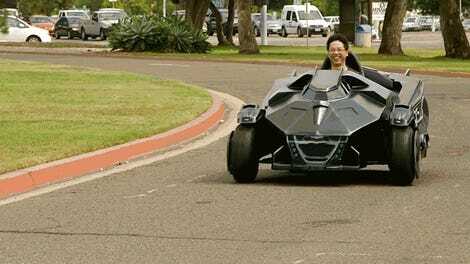 But as a remote control car, this Batmobile is a little disappointing. A working exhaust, powered by a miniature built-in fog machine, is one of the toy’s coolest features. A removable, rechargeable 1,100mAh lithium ion battery gave us over an hour of playtime. Driving the Batmobile using touchscreen controls and an app is far from ideal, but the live video feed streamed from the Batmobile’s cockpit is a neat feature. Built-in speakers provide realistic engine and weapons sound effects, but they’re almost too loud for use indoors, and there’s no way to turn them down, or turn them off.